The vision of Krishna’s Divine Cosmic Form in Book Eleven is surely one of the most memorable and impressive moments of the Bhagavad Gita, if not the entire Mahabharata. While the Mahabharata is filled with amazingly original tales, encompassing every imaginable fantastic adventure and romance, along with understandings of the deepest metaphysical import and meaning - there is something supernally perfect in Vyasa’s depiction of Krishna revealing his Imperishable (akshara) Eternal (sasvata) Supreme (param) Spirit (purusha) to his friend, the brave and handsome warrior Arjuna. The Sanskrit term Visvarupa is used to name Krishna’s Divine Form and is defined as ‘having many forms’. 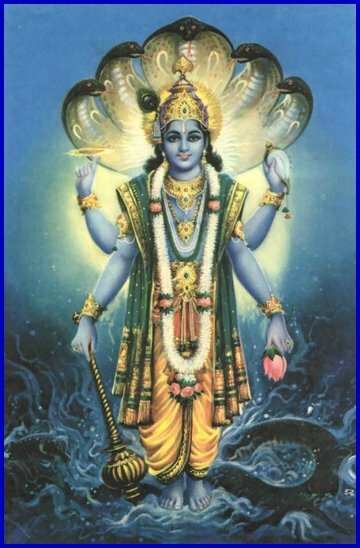 The word Visva is pronounced Vishva and can mean ‘to pervade’ (M.Monier-Williams) - hence the god Vishnu the Pervader who ‘spreads in all directions’ (A. Danielou). Arjuna’s vision is of a Being who embodies all the gods, the seers, and the anti-gods (XI.15). This universe is a field made up of polarities - and therefore the Being who pervades the All contains not only the forces of Light, but also their opposites, the Darkside, the anti-gods, the demonic. 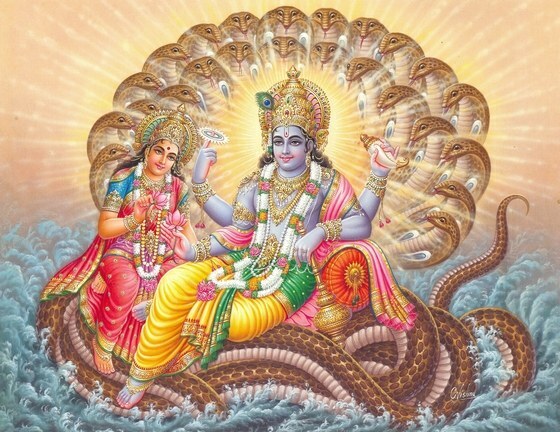 To describe the vision of the anti-gods, the poet-author Vyasa uses the Sanskrit words uragan divyan, which means the divine or heavenly serpents. The word uraga refers to the semi-divine race of serpents known as the Nagas, who are usually depicted with a human face. The Nagas have three kings. The Serpent Sesa (pronounced Shesha) is one of these three and is the metaphysical representation of all that remains after the periodic destruction of the universes. Something must remain after the Dissolution and the serpent Shesha is the principle of the Remainder of destroyed universes. In the Mahabharata, the Adi Parva Ch.36, Shesha is portrayed as a great being who has become a penance-practicing ascetic. His austere penances have brought him to an exalted state and the attention of the Creator god Brahma. Brahma is delighted by this request of ‘self-denial and love of peace’ (M.N.Dutt) and commands Shesha to go underneath the earth and ‘steady’ her by holding the earth on his head. This underneath is entered into through a hole. ‘Thus does the snake Shesha, the greatly powerful Lord Ananta, (another name for Shesha meaning Endless), live underneath the earth, alone supporting the world at the command of Brahma.’ As you can see, not all anti-gods are perceived as being evil. This story illustrates the vital importance of the role played by the negative forces. The Darkside is around to ‘steady’ the entire world. Without the negative forces, the positive ones would have nothing to polarize with and against. The old visual concept of the atom as the proton, neutron, and electron serves as a good example. These so-called ‘myths’ are encrypted codes filled with wisdom and the mechanics of metaphysical truth - for those who have the ears to hear. The demonic is written about extensively in the Sanskrit texts and the lineages of the Nagas Snake People are named in the Mahabharata (Adi Parva, Ch.35). The Mahabharata, which is considered to be the fifth Veda, states that the number of snakes defies calculation in this world. The Indian scholar Krishna Chaitanya/KK Nair gives the date 150 BC for Vyasa’s Mahabharata, even though it is certain that the stories and metaphysical wisdom in this great epic are far older. These are tales that have been passed down from generation to generation and were turned into exquisite poetry under Vyasa’s creative genius. In fact the war at Kurukshetra takes place just before the end of the previous Cycle of Time, the Dvapara. For Krishna is clear when he says that the Kali Yuga will begin when he leaves the earth and the Kali is said to have commenced in 3,606 BC. 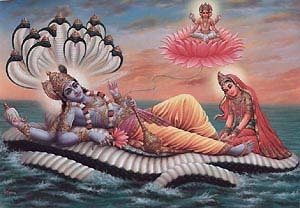 The Sanskrit text the Vishnu Purana contains the stories of Vishnu sleeping on Shesha the Serpent and was written much later than the Mahabharata. The fact of little to no clear evidence for an exact date of a manuscript is quite common in the scholarship on Hindu texts. The scholar H.H. Wilson who translated the Vishnu Purana into English, gives the date 1045 AD. I feel that it is useful to keep in mind that Hinduism has always been an evolving expression of man’s reverence and love for God. All new religious forms must be rooted in the Vedas, but that has not prevented these forms from constantly changing to suit the needs of the people and the times. Thus Hinduism, like all religious beliefs in the Kali Yuga, has produced seemingly endless and fascinating fractal-like developments. In his book ‘Hindu Concept of Life & Death’, the author Shyam Ghosh states that the Vedic Seers had little interest in the ghostly afterlife and that the ‘details of the Yamaloka (the world of death) are therefore found missing in the Vedas.’ However the Puranas, which were written centuries later, are loaded with the ‘vivid accounts of some imaginary goings-on’ in these realms. Some of these torturous descriptions of horrible sufferings found in the Puranas would have pleased even the most ardent Grand Inquisitor. But as Ghosh points out, the Hindu heavens and hells are only temporal and the early Vedic Seers were much more concerned with life here and now, and the opportunity it provided for liberation from all transmigration. Not much can be achieved once the soul has left the body. 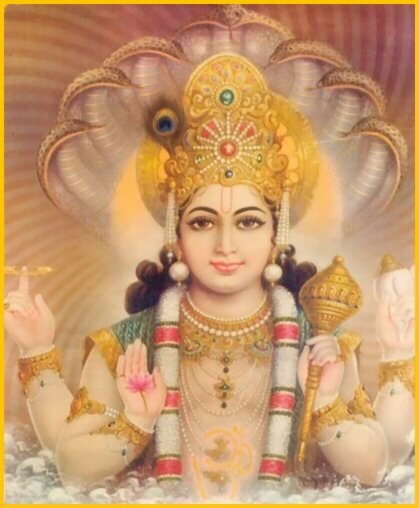 Arjuna sees for himself both the gods and the anti-gods in the Divine Form (XI.15). The all pervading Supreme Being is the All - Vasudeva sarvam iti. A polarity universe cannot exist without the darkside demonic. The night follows the day, just as the dawn will surely dispel the darkness of night. The heavenly serpents, the Nagas, seen by Arjuna are not to be confused with the hill people tribes in Northeast India. These human Nagas are reported to be predominantly Mongoloid and were known for their fierce resistance to British rule. Their beliefs included the erection of large stone monuments and the custom of taking heads based on the belief that a powerful soul-substance resided in the human head. The Sanskrit texts contain elaborate descriptions of many other races of beings beyond the gods. These are the Asuras or anti-gods. They include the Daityas and the Danavas who are supernatural beings that can dwell in the lower worlds and yet still enjoy heavenly pleasures. The Rakshasas are ‘titans’ and ‘powerful enemies of the gods’ who can take any form (shape-shifters). They can appear as demons and ogres, and are said to ‘devour human beings, animate dead bodies’, and in general afflict mankind (A.Danielou). The Rakshasa King, the ten-headed Ravana, is the villain of the Ramayana. The Kalakanjas are the stellar spirits, and the Kalejas are the demons of Time. There are also Pisacas who eat raw flesh and are said to be hideous. The Yatus are sorcerers and are similar to the Rakshasas. There are vampires (vetala), ghosts (preta), the souls who wander (bhuta) because they died a violent death, and the Fearful-Spirits (bhairava) who are the attendants of the god Rudra. I do not accept the way mythology is seen in the west. In fact I feel that it is insulting to relegate the timeless primordial beliefs of millions of people around the planet to mere myth. At this point in the Kali Yuga, most human beings are now completely cut off from the Invisible Realms and are limited to the five senses for any perception of the layers in the temporal illusory hologram. The ones who have no vision, and perhaps little imagination, ridicule those who have the ability to ‘see’ what most cannot. But that does not make them right. There are seven higher worlds and seven lower worlds in Hindu metaphysics. 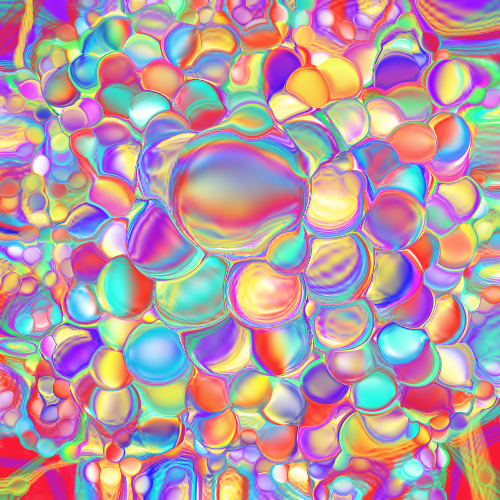 These Loka worlds reflect a wide spectrum of consciousness, as they are made up of specific frequencies of waveforms. Perhaps the demon worlds of the Sanskrit Puranic texts, the ones known as the anti-gods, the Asuras and Rakshasas, are reptoid or Borg-like extraterrestrials. These worlds do not consist of reflected light, as does our solid five-sense material world. They are self-luminous. [239-42] … there are divine lotuses … made of gold … their inner surfaces are very tender. The lotuses covering up the whole place seem to be so many umbrellas. [260-263] Some [of the inhabitants] are … horse-faced … a few have the faces of the lord of the beasts; other have faces and bellies like those of elephants, others are elephant-faced; a few are lion-faced and tiger-faced … others can assume any form they wish. If this had been translated before today’s science began to fool around with genetic manipulation, naturally these creatures would have been seen as mythological. The same images of human bodies with animal heads are sprinkled on the ancient Sumerian and Akkadian cuneiform tablets. The Vayu Purana also says that the gods have their own space ships. [264-266] Lord Mahesvara [the transcendent Lord Shiva] of ten arms sports therein … He is being respected and diligently worshipped by those people moving about in aerial chariots. In 1987 the scholar and metaphysical writer Alain Danielou wrote ‘While the Gods Play: Shiva Oracles & the Predictions on the Cycles of History & the Destiny of Mankind.’ I first came across this book in 1991 and in my view, this is one of the most interesting books I have ever read. Danielou is French, as is Rene Guenon, and to my knowledge the two men respected each other and did communicate with one another in a friendly manner. ‘While the Gods Play’ was my first serious introduction to the theory of the Cycles of Time and Samkhya. I highly recommend this book which is filled with gems of knowledge. Danielou says that we have come to call those beings we can no longer directly perceive gods and spirits. This implies that there was a time when we could ‘see’ them. In those previous cycles of time we recognized these beings as expressions of our Supreme Self. In our own era, we still sense their presence. Even the most psychically insensitive have likely felt the presence of a ghost. These beings are ‘of various types’ and are ‘not immortal.’ Recall what Krishna said about the recycling that goes on the the Myriad Realms (IX.20-21). These invisible-to-most beings are as subject to time as we humans are. Monsieur Danielou makes the excellent observation that in order to communicate with another being, you must be on a similar frequency. This is something we all know in our own experience, and is reflected when we say that someone just doesn’t understand us and that we are not on the same wavelength. Whatever you sense or ‘see’ or perceive in the Invisible is literally on your wavelength. This is why some have visions of angels, while others see demons. Some people are taken by extraterrestrials who teach them spiritual wisdom, and others have more painful experiences. If you want to shake the ‘cooties’ and get rid of negative entities, then you simply have to raise your frequency. You do this in the tried and true old fashioned way by becoming a better person. You work on being kind and less judgmental. You get rid of your addictions. Drug and alcohol molecules have specific frequencies which resonate with precise locations in the Invisible Realms. Most of these are less than pleasant. Another important change in behavior would be to stop focusing on these lurid experiences as a means of your identity. Once you change your frequency and raise the vibratory rate of your consciousness, the entities who have been perniciously clinging to you, won’t be able to find you! Location is a function of consciousness. It is well known that time as it is experienced by the gods or other beings is quite different than our human time. The Sanskrit texts also say this in regard to the longevity of the gods and the Day of Brahma is said to last 4.32 billion years. Danielou reveals that each being experiences time in the manner that is relative to the body it is inhabiting. This experience of time is ‘determined by the vital rhythms of each species’ - the heartbeat. Danielou points out that these differences in the way time is experienced, shed light on the phenomenon of the speed at which ‘sightings of celestial beings or extraterrestrials’ take place. He says, ‘Their presence in our world, which may last a day for them, takes only a few seconds for us.’ This corroborates what many abductees have reported. And to this day, [those] who ... know the self as I am Brahman [IS-ness], become all this universe. You can draw your own conclusions about these entities, grand and gruesome, based on your personal experiences. But I urge you to keep in mind that these beings, no matter how dazzling, are temporal. They are not immortal. They are lovely seductive side-trips and part of the Myriad Worlds. They are not the goal. Communicating with them may be fun, and may give you a huge identity and make you popular with those who falsely believe that you can do something for them. But they will not give you your enlightenment. No one can. Only by your own efforts can you Remember who you are and find your Way Home through the God within the Heart.